The sketch for decoding the time radio signal DCF77 is greatly improved: I use interrupts for handling the signal and a backup timer has been added. Of course, you also need the DCF77 receiver module and a pullup-resistor, as described in my old post. 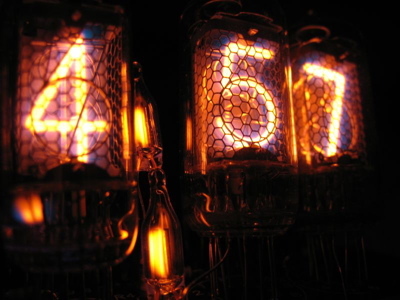 BTW: The picture above shows a Nixie tube clock. I ripped the picture shamelessly from flickr, there’s a photostream showing the creation of the clock. Cool project. Note that the archive is a BZip2 archive – I don’t have Windows around, maybe Winzip doesn’t understand this. got the pde now, i still do not understand why i cannot the v2 file, the v1 file did work after removing the .bz extention. what do you mean –> .bz extention. thanks for your very nice job. versuche mich auch gerade darin, Deine DCF77 Software auf meinen Arduino zu übertragen. Leider habe auch ich einen Fehler beim Compilieren, weil TCCR2 nicht definiert ist. Liegt das an V017 der Arduino Software? I use the latest enviroment 0017 – is this a problem? Has anyone solved the TCCR2 problem yet? I’m using environment version 0017 too, and a duemilanove with an “ATMEGA328″. So far with my reciever that i got today i have not got it working but its most likely my fault. I have the same error and I am using a Freeduino V1.6 wtih the Conrad DCF77 and environment 015. It’s the same form me! Are there any solutions until now? I’m using Nano-Board and also Arduino-Software version 0017. What have you done so that it runs the program? * Interrupthandler for INT0 – called when the signal on Pin 2 changes. and removed the DCFSignalState assignment in the main loop. * The interrupt routine for counting seconds – increment hh:mm:ss. The timer is started in "Parity check OK – updating time" branch via MsTimer2::start(). The sideeffect of placing the MsTimer2::start after a positive parity check is that the time is only printed after successful decoding of the DCF77 Data.